The Orientation to Beads and Jewelry Findings is being offered online at the Land of Odds. This course was developed by instructor Warren Feld because he noticed that beginner beaders didn't always make the best choices when it came to quality. 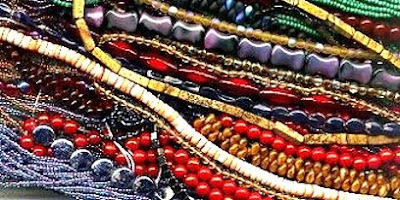 Personally, I learned the hard way a long time ago that if I was going to put 40 hours or more into a bead embroidered necklace, I wasn't going to skimp on the cabochons, beads, and metal findings! Please visit the link above to take advantage of the knowledge that Warren is offering.